Introducing the fourth pillar of the EDF. 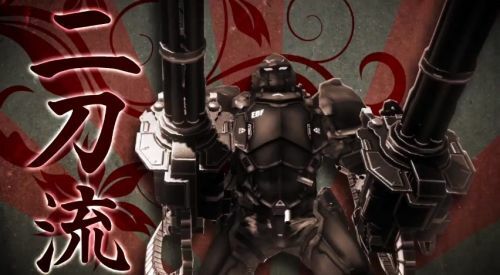 Did someone call for a power-armored samurai who can dual-wield miniguns?! Because Earth Defense Force 2025's new Fencer soldier can do that, and more. When he's not raining metal death on the Ravager hordes, this BAMF is equipped to get up close and personal with the giant bugs and robots. He's got an indestructible shield of saving, a giant hammer of thwacking, and a deadly spear of poking. He's also decked out with heavy artillery --lots and lots of heavy artillery. It's kind of ridiculous. It looks like someone shoved a mini-Gundam into EDF. I'm okay with that. The following video takes EDF 2025 to a new level of personal hype, which I didn't think was possible. Prepare yourself. EDF 2025 will have three other classes, including the standard infantry Ranger, the flying Wing Diver and the air strike-capable Air Raider, but nuts to them. I found my class. I don't care if he looks out of place. I'd like to think that he wandered onto the set from another game and said, "I killed everything in my game. Mind if I kill everything in yours?" And without waiting for an answer, he started wrecking up the place. Earth Defense Force 2025 supports two player local co-op and four player online co-op. It will launch on the Xbox 360 and PlayStation 3 on July 4th in Japan. We can expect it stateside later this year. Page created in 0.2587 seconds.